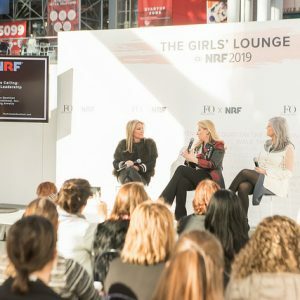 Women In Retail Leadership Circle | Women Rule at the NRF Big Show! Well, that’s a wrap: This week I survived my 10th NRF Big Show in New York City! And I’ve lived to tell the tale! As I started to analyze the long list of retail trends I gleaned from speaking to retailers, consultants, analysts and service providers, as well as attending sessions at the event (trends such as the growth of private-label products; the rising influence of checkout-free retail; the increasing value of pop-up stores; pervasiveness of artificial intelligence and machine learning; and more), perhaps the biggest trend of all is that women really ruled at the Big Show this year. As I noted in the post below featuring tweets from the show, dozens of women appeared on all of the stages at the Big Show. Founders and owners of companies were represented, as well as CIOs and technologists; engineers and e-commerce experts; and CMOs and CEOs. But the women power was really felt at the Girls’ Lounge, powered by The Female Quotient, an experiential pop-up area that was front and center at the Big Show this year. Panels in the Girls’ Lounge featured discussions on topics such as the evolution of retail, how female leaders succeed in male-dominated industries, and the how-tos of mentorship. During each panel I listened to, smart and successful women spoke passionately about their career journeys; how they give back; and how they help each other. But the real excitement came from the packed audience of mostly women executives. You could literally feel the excitement, bonding and networking happening in real time among the crowd. If you missed the NRF Big Show this year, don’t fret! The Women in Retail Leadership Circle will be partnering with The Female Quotient to once again host the Girls’ Lounge at Shoptalk! The fast-growing retail conference will take place March 3-6 in Las Vegas. And it will be better than ever! Because of the positive feedback Girls’ Lounge attendees provided last year, Shoptalk will be moving the lounge to the show floor so that more women can join in and network! Our partnership with The Female Quotient @The Girls’ Lounge will take place on Mon., March 4 and Tues., March 5. It’s sure to be a can’t-miss event. Are you attending Shoptalk? If so, please let me know. We’re hard at work creating an interesting and engaging agenda for the Girls’ Lounge. If you’re attending Shoptalk and interested in being on a panel for the Girls’ Lounge, feel free to drop me a line at mcampanelli@napco.com. Women Rule at the NRF Big Show Are You Going to NRF’s BIG Show? Speaker Squads Set for Girl Talks! Way to Go Chico’s!